We have a number of interesting workshops and garden talks throughout the festival. Educational and informative talks to accompany this years gardens is our approach. These speakers have all dedicated their time and effort to the cause. In 2016 Christy Ralphs converted a small paddock of kikuyu grass into a productive growing area to trial growing annual cut flowers. The aim was to supply unusual local fresh flowers, for florists, weddings and for the local Saturday market. It was a successful trial, and more land is being converted for growing for the current season, including roses, dahlias, and perennial flowers. 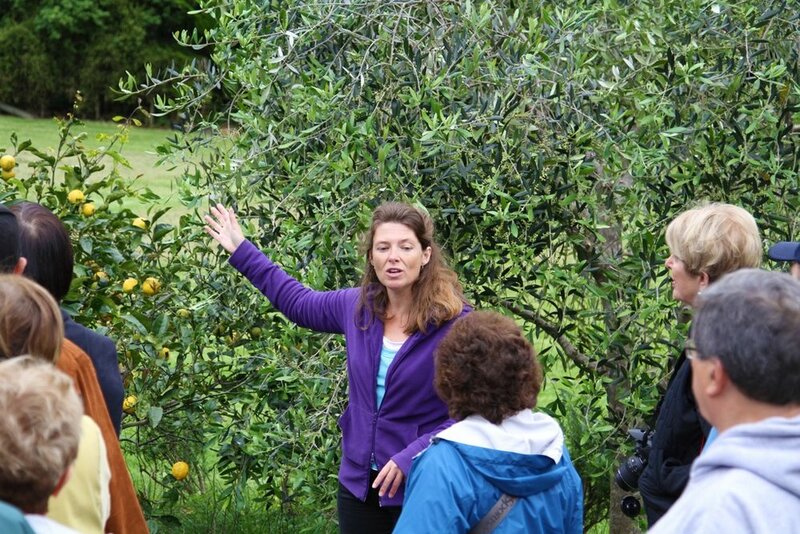 Christy will lead a tour of the flower growing areas at Nourish Gardens, part of Owhanake Bay Estate. She will discuss lessons learnt, successes, and plans for future cut flower growing. If you have an interest in flowers and cutting them for your own appreciation, or to give to others, then you will enjoy and learn from this peek into a small scale intensive flower farm. *Please park on roadside (not up driveway). *Ability to walk up steep driveway, and up a short but steep grass hill to the flower field is required. Founder of Grow Inspired, Claire Mummery is one of New Zealand’s foremost pioneers in sustainable living, nutrient-rich food production and large-scale organic garden development. Her extensive experience in organic practices, sustainability and permaculture now spans three decades. Claire’s passion for ‘The Good Life’ has fueled her career, and most of her unrivaled expertise has grown from her own hard work, curiosity and self-education. Claire is endorsed by Zing Bokashi and EMNZ, and her specialisms include composting, worm farms, garden transformations, organic practices, and growing nutrient-dense food. Claire now shares her time between projects with private clients, attending speaking engagements, hosting workshops and distributing an organic range of products that Claire believes in. Claire’s exciting hands-on workshop will cover the fundamentals of composting, worm farms and the innovative technique of Bokashi on both small and large scales. By the end of the one-hour workshop, you will understand the integral role that Bokashi composting plays in the health and wellness of your plants and in diverting waste from landfill. Learn the secrets to building your own thriving compost at home so that you can grow nutrient-rich food in your soils. Also on offer is the opportunity to purchase from Claire’s organic product range to help you on your way to putting everything you have learned into practice at home. Whether you're pruning young trees, or needing to regenerate older trees Anne Stanimiroff of Rangihoua Estate will show you how to achieve this. Korora Grove has an olive grove to tour with a variety of olive trees. Lyndell has been designing gardens for more than twenty years in Auckland, Wellington, the South Island, Australia and The Netherlands. She designed a medal-winning vegetable garden for Yates at the Ellerslie Flower Show in 2007 and her own Birkenhead garden won Gold and Best Design for a Small Project at the Landscaping New Zealand National Awards in 2010. She moved to Waiheke in 2015. Simon and Mary’s garden was already underway when Lyndell was invited to contribute, using her design skills to expand on their ideas to create a “really beautiful, productive garden”. The workshop will cover some of the principles and methods of garden design with particular reference to Simon and Mary’s garden, the client/designer relationship, and the way designers interpret their clients’ brief. This will be an informal session with plenty of time for questions and discussion. Using the ancient craft of distillation, using hand crafted copper alembic stills, to make essential oils and hydrosols is magical and delightful. Turn your fragrant flowers into floral waters and your herbs into essential oils. Learn what you can grow in your garden and what grows around you that you can distill for cosmetic, culinary and therapeutic use. Distillation is not only for essential oils and hydrosol, see how you can make your own artisan spirits too. Andy Spence, local businessman and thespian will give a talk about environmentally friendly herbicide use with his Cut'n'Paste Weed Gel Products. Being in a gel form in a bottle with an applicator brush means that there is no need for human contact with the herbicides and it also eliminates any bykill of other precious plants that you get with sprays. Andy developed Whakanewha Regional Park when he worked as a park ranger, as well as serving as the Waiheke Island biosecurity officer. He gained a great familiarity with Waiheke's legion of weeds. He wanted to produce a user friendly way of carrying out effective weed control with herbicides that the public and conservation volunteers could safely be trusted with. After 7 years the products are sold everywhere throughout NZ and much used by DoC, Councils and weed contractors because they work. Silex Tools is a leading importer and wholesaler of quality tools for the horticultural, arbor cultural, trade and industry sectors. And our products are sold through specialist stockists and retailers throughout New Zealand. A demonstration of the latest Silex, Silky, Okatsune, Castellari and Lowe tools will be demonstrated and on display and for sale. Starting at 12 pm the Silex Tools representatives will also sharpen your tools.